A black and white portrait photograph of George Scott. George Scott was born in Edinburgh, Scotland on February 28, 1912 and came to Whitby, Ontario around 1913. He worked at Ontario Hospital at Whitby from the early 1930s until 1937. In 1937 he moved to Niagara-on-the-Lake, Ontario. He enlisted in the Royal Canadian Air Force in the Second World War and went overseas in 1943. He was attached to the RAF Porcupine Squadron based in Skipton-on-Swale, Yorkshire and was awarded the Distinguished Flying Cross. He took part in 20 operational flights over enemy territory and was being trained to become bombing leader of Porcupine Squadron. On his 22nd mission on August 17, 1944 during a mine-laying exercise along the Kiel Canal in Germany his plane was shot down into the North Sea. He is buried in the Allied Military Plot, Aabenraa Cemetery, Denmark. 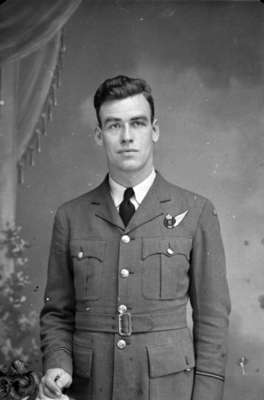 According to the Canadian Virtual War Memorial website, Flying Officer George Scott was part of the 433 Squadron. He was son of John and Susan Foggo Scott and husband of Florence Evelyn Scott, of Niagara-on-the-Lake, Ontario. He is commemorated on Page 439 of the Second World War Book of Remembrance. This photograph also appears on the back of the twelfth leaf of Alex Brown's album. There are four photos on this leaf. The top left photo is of L/T. F. J. A. Coleman. The top right photo is of Douglas Harper. The bottom left photo is of Pte. Leslie Perry and bottom right photo is George Scott. Photo also found on the back of the fourteenth leaf of Alex Brown's album. This leaf has four slots for photographs on each side. The photo at top left is Evans Michael. The photo at top right is Ted Adams. The photo at bottom left is George Scott. There is a photo of a newspaper clipping of R. W. Rea at bottom Right. This photograph also appears on the front of the fifteenth leaf of Alex Brown's album. There are four photos on this leaf. The top left photo and bottom right photo are a newspaper column related to George Fred Carter. The top right photo is of James McIvor. The bottom left photo is of George Scott.